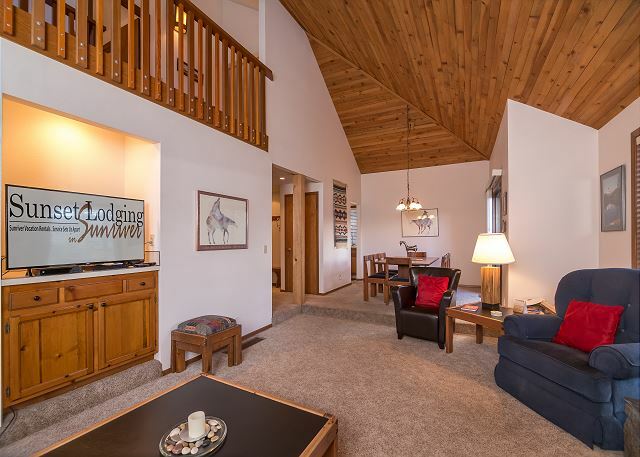 Puma Lane #5 is a 2 bedroom, two bathroom plus loft vacation home perfect for up to 8 guests. The large living room provides a fireplace and a flat screen TV. The dining area leads to the fully stocked kitchen where you can cook up family favorites, or use the BBQ on the privacy-fenced deck. The bedroom on the main level offers a king-size bed and the 2nd bedroom upstairs has a queen bed. 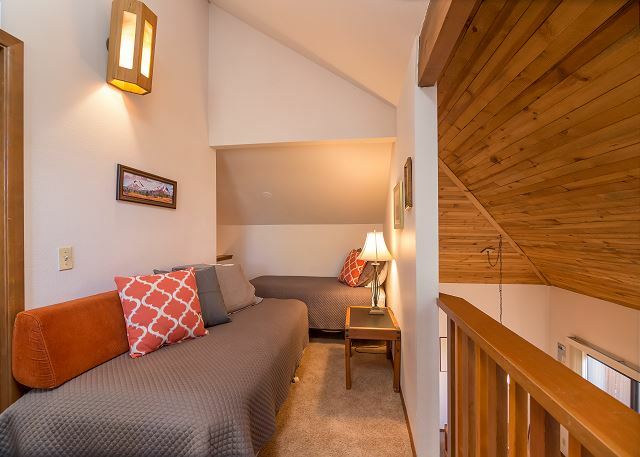 The loft has 2 twin beds...perfect for families traveling with children. There is also a queen hide-a bed in the living room. Relax in the enclosed, private hot tub underneath a starry night, ride the 20+ miles of bike paths on the 4 provided bikes or walk to the newly completed SHARC Aquatic Facility! Speed down the water slides, float the lazy river or simply soak up the sun! 6 unlimited passes to SHARC when you stay in Puma Lane #5! Along with free tennis and free access to the Sunriver Marina. 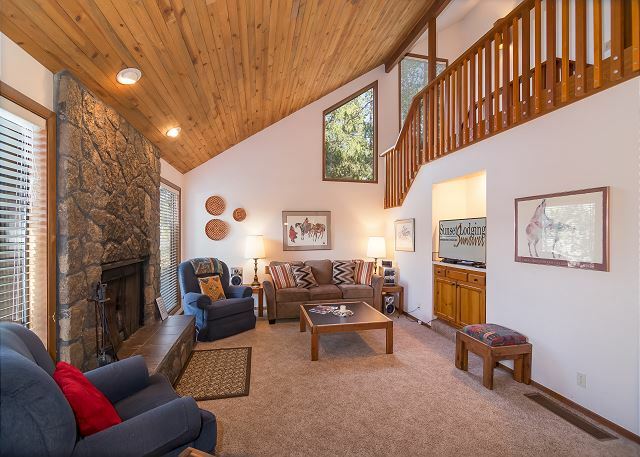 1 King, 1 Queen , 2 Twins in loft area, 1 Queen Hide-a-Bed, gas BBQ, Flat Screen TV, TV/VCR, DVD player, microwave, 4 bikes, D/W, W/D, fireplace, gas BBQ, enclosed Hot Tub, 6 Unlimited SHARC Passes, 2 levels, near the Sunriver Village Mall & SHARC. This is the second time we have stayed in Puma 5. It is a very comfortable house that fits our needs. We have stayed at various different vacation homes managed by Sunset Lodging over the past many years and have never been unhappy. I own a carpet cleaning company and do business with several vacation rental companies where we live and my wife cleans vacation rentals. As a result of what we both do for a living we are very aware of the housekeeping and cleanliness of a vacation home when we check in...we have never been dissatisfied with that at any Sunset Lodging home. Bob, Thank you for your 5 star Review! We are so happy to hear that you were comfortable and satisfied in the home and with our service! Thank you again for your kind words, we hope to see you again soon! The house was great and a good location. Thank You for the 5 star Review, Kelly! We are so glad to hear that the house was great and you enjoyed the location! Come back soon! We have stayed at this house several times. 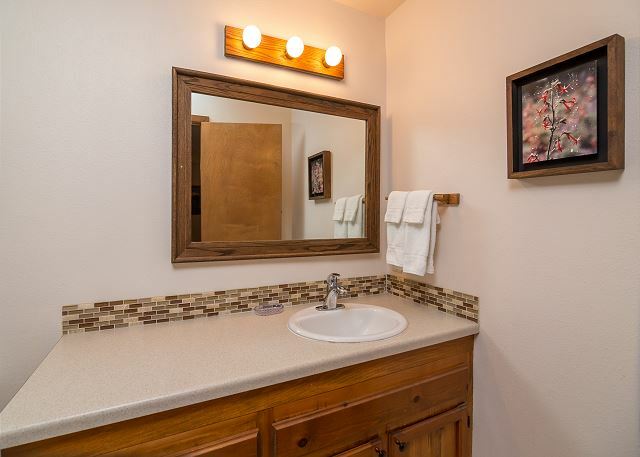 It is clean, convenient to the Village and right across the street from the SHARC. Plus a jacuzzi to relax in after being active all day. Thank You for the 5 star review, Kristine! It sounds like Puma 5 is becoming a tradition! We hope to see you next year! Just super, the family really enjoyed it our time together, mission accomplished, our stay will be longer next time.. Thank You for 5 stars, Tony! So glad you enjoyed your stay with us, we hope to see you again soon! Thank You for your review!~ So glad you enjoyed your stay and the location and made use of the Sharc passes! We hope to see you back in Sunriver soon! This home worked out well for us as a base for skiing at Mt. Bachelor. 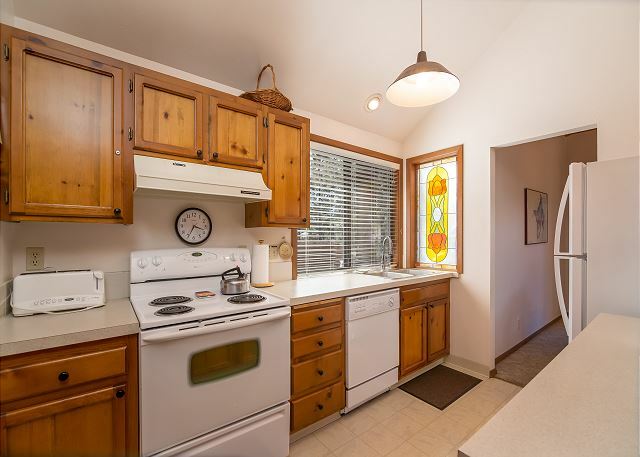 Though the kitchen is small, it is well stocked with dishes and cookware. The table in the living room is also perfect for crossword puzzles, which is not always the case in rentals. We enjoyed the fireplace and hot tub as well. 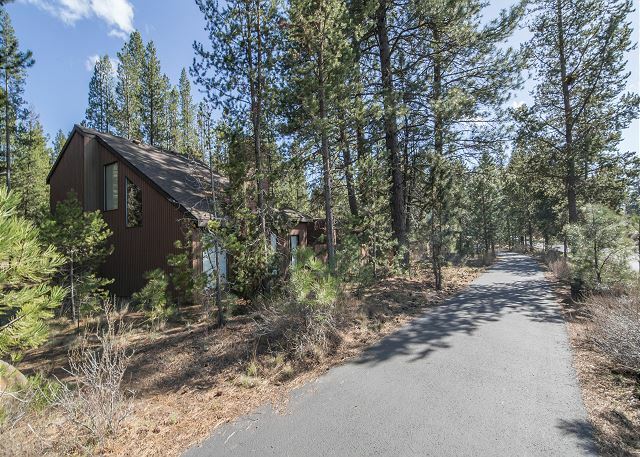 I gave the house three stars for location due to the fact that it backs up to Sunriver's main thoroughfare. It is within steps of the Shark facility, however, for those who plan to use that facility. Thank you for your review and stay at Puma 5. We're glad to know you enjoyed your stay and that the small details like a table good for crosswords and a well-stoked kitchen enhanced your visit. We look forward to welcoming you back to Sunriver soon! Thank you! I was attending a conference that was being held in a meeting room inside the SHARC complex. This very nice unit was situated right across the road and was an easy walk every morning. My only disappointment was that the "fitness area" within the SHARC complex was not one of the SHARC amenities that were available to guests. Thank You for your review! Happy to hear that you were able to take advantage of the convenient location that Puma #5 offers! Unfortunately, the gym at the SHARC facility is a private (owner only) access, but we hope you were able to enjoy the rest of the facility and welcome you back to Sunriver anytime! Thank you for your great review! We hope to see you again soon! Location is central--close to SHARC and Village--and also makes it nosier than other units as it's very close to Beaver Drive. There is a loose board on the first step to the house that could be dangerous and the outside patio and table were dirty. Other than those things, it worked well for our family of four. Kami, we appreciate your feedback and your review. I will pass along your message to our maintenance department to check the loose board. We hope to see you again soon! Great time with family. Excellent size for our big family. Hi Steve, Thanks so much for the great review! We are glad to hear that your family enjoyed their stay. Come visit us again soon! We stayed over the 4th of July and chose the location due to it's proximity to SHARC and having a hot tub. It was exactly as described and was comfortable for 2 adults, 2 teens. I appreciate that they had pretty much every kitchen utensil needed, some random spices, pool towels and lots of extra blankets. The bikes were in good shape: 3 mens, 1 womans, with helmets available. There is no AC which isn't unusual there, but it did get HOT! There are fans and we ended up going to SHARC in the evening to cool off and slept later. We would stay again. Thanks so much for the great review Emily and Dan! We are thrilled that you had such a great stay and hope you come again to visit us soon! Really liked and enjoyed the house! We are so happy that you enjoyed your stay in Puma #5. We are so happy that you chose Sunriver Lodging for your AD conference. Come back and visit us again in Sunriver soon! We had a fun stay at the rental. Like the location near pool easy to walk to.we would stay there again. Awesome, Gerald! We hope you'll get back to Puma 5 again soon! Brilliant. Exactly as described and we really enjoyed Sun River and the Bend area. AWESOME!! Thanks for staying with us at PUMA 5, Don. We hope to get the chance to host you here in Sunriver again soon. My relay team had a wonderful stay at Puma #5. We were happy with the layout of the home and the amenities. We would certainly book here again. They keyless check-in/out was very easy. 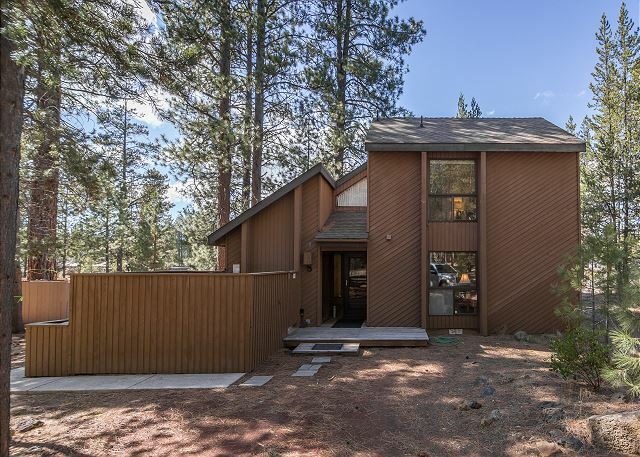 Closest house to SHARC in Sunriver for your family! Check in was the easiest of any rental we have stayed in Sunriver plus they called to let us know it was ready early on day of arrival. 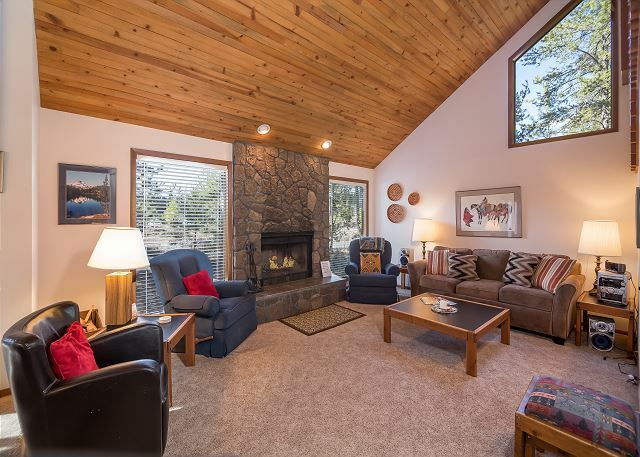 Being the closest house to SHARC in Sunriver made it easy for our family to come and go as well as a .5 mile distance to the village making it easy for everyone to find their way not getting lost in the circles of Sunriver. House layout was perfect for our family with 2 adults downstairs in the master and 4 kids upstairs in the bedroom and loft giving everyone their own space. We will stay at this house again with our family as location, cleanliness, layout of home and rental company was easy to work with! You can't beat being right across the street from the SHARC and walking distance from the village! Property was clean and original, bedding was nice. Biggest problem was one of the bikes having a flat and I called the Sunset staff. They arrived in minutes and took care of getting it fixed. Polite, efficient service is always appreciated. The kids loved it. It was convenient and we loved the Sharc passes and bikes. The TV in the second bedroom was too small. The unit was roomy and open. The outside area was sufficient to run around in. We love Sunriver! We love Sunriver too!!! Thanks so much for allowing us to host you, Jenol and hopefully we'll see you back in Sunriver soon! It had been since 2007 since my last trip to Sunriver and it was my girlfriend's and her kids' first time. We all (2 adults / 3 children) enjoyed our stay at Puma 5. They had all the amenities one would need. The hot tub was a big hit with the kids as well as us adults. There's nothing better then sitting in a hot tub out in the freezing temperatures with snow falling all around you, in a private setting. For those who may be interested in the SHARC it's directly across the street from the home. If there was one thing to note as a negative it would have to be the bedroom floor above the master. It is very noisy. We could hear every movement that was made when we were in bed. Other than that, we were happy with our stay and would rent this home again. Other than no airconditioning in the unit, our stay was enjoyable and well worth the money. 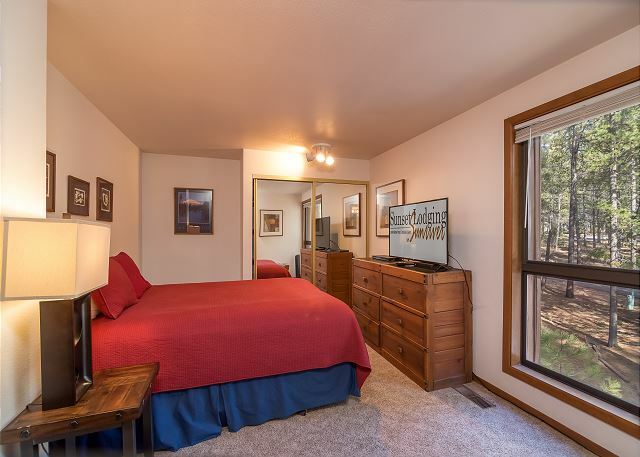 On our next visit we will rent a larger unit (3-4 bedrooms) for additional comfort. We really enjoyed the Sharq facility (many of us only used it just one day). The location of the rental was nice since four members of our group are older and long walks would have made it difficult on them. The hot tub was enjoyed by all in our party. Not having to rent bikes was a nice perk as well. We plan on making this an annual event for our family. The only negative is we will not be able to meet the September 15th deadline for preregistration . I am a teacher and havingn income over the summer makes this difficult. I want to thank Scott Pence and his staff for providing us with wonderful experience. David: we consider it a privilege to host your family, and as a family run business with tons of kids, we THANK YOU for your service as a teacher! We will look forward to next year and when you are ready to rebook, please ask to speak with our marketing department. Thank you for this great feedback, we really appreciate it! Our stay at Puma 5 was an enjoyable family vacation for my husband, myself and my brother and sister-in-law from New Jersey. We had other family members staying in another house. Walking distance to the SHARC, and to the Village, made our stay very relaxing. The guys golfed, and the ladies had massages and facials at Sage Springs Spa. We mostly ate dinner at home but did go out to dinner two evenings. 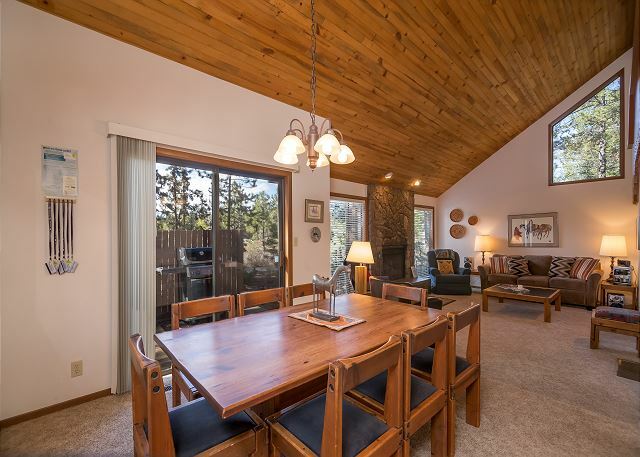 One of the highlights of renting a vacation home is the option to 'eat in' and share nice family meals in Sunriver AND in your home away from home. Glad you got the best of both worlds! Hurry back to Sunriver Rosemary! I rented this property and took my three young boys. We stayed for five nights. 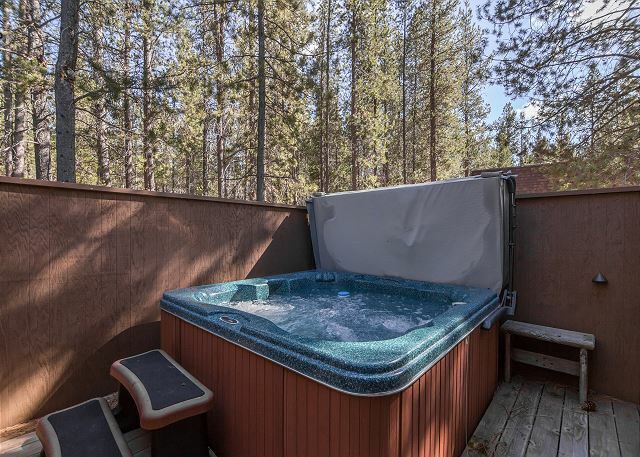 It was a great time they enjoyed the hot tub the bikes and all of the amenities of Sunriver. Greg - with an intense focus on family vacations, these reviews are really great to get. We often have the pleasure to host guests who came to Sunriver on a family vacation when they were kids, and continue the tradition. We certainly hope that will be true for your boys! So glad you all had fun. Great 4 night stay in June. Location was great to ride bikes or take a 10 minute walk to the Village restaurants. The Village Bar and Grill had fantastic Burgers and sandwiches, I loved the seasoned fry's at the Sunriver Brewing Company. Loved the crisp crust at Panini's Pizzeria. The shredded Beef Enchiladas were my favorite at El Caporal. Puma 5 house was spacious and comfortable. The beds were comfortable too and I'm very picky. The downstairs bedroom had a ceiling fan as well as one in the loft. The kitchen is fully stocked plates & bowls for 12 in Stoneware & Plastic. There was even a blender and fantastic waffle maker. Also spices above the stove. I was a little worried about being so close to the road by a busy location (SharK facility was right accross the Street, But it was super quiet and I could relax on the deck lounge chair with a privacy fence between the house and bike path. The bike paths were why we came here. To make the enjoyable ride even more special, I saw two deer while riding around. The TV got several movie channels, which was a nice way to spend the evenings when we weren't in the hot tub. Overall, we had a great stay and plan to come again. Thank you, Christina! 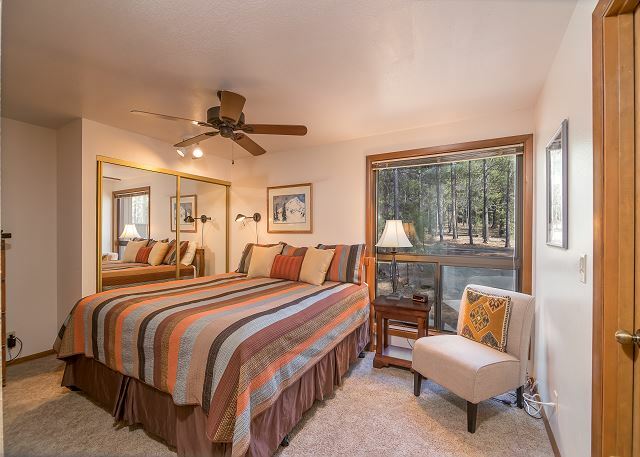 We are always so glad to get good feedback not only on our homes but also for our neighbors here in Sunriver. I hope you don't mind, I've sent your comments along to The Village Bar and Grill, Sunriver Brew Co and Panini's. 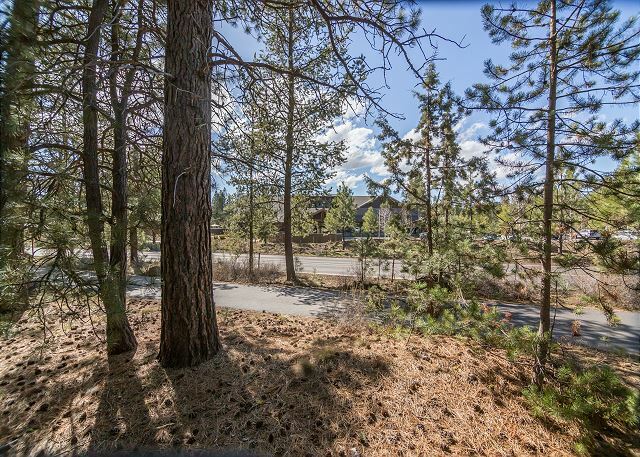 As a community, we collectively strive to get people coming back to Sunriver again and again. We hope it won't be too long before we see you again! We enjoyed our first stay in Sunriver and everything went very smoothly. We actually locked ourselves out of the condo the very first night but the management was there within a few minutes with another key - very appreciated as we had had a long day of traveling and we were outside sitting in the car because of the cold temperature. Puma 5 is great rental. I would recommend it to anyone except for my first wife. It is well stocked and very cozy. You will love it. Thank you for your review of Puma #5! My family of four, along with two grandparents for a few nights stayed at the house for 9 nights. It's a great location right accross from SHARC and a short walk into town. The house, along with almost all houses at Sunriver is older, but it was comfortable and we didn't have to worry to much about the kids hurting anything. We didn't even turn on the tv but there was a flat screen in the living room along with two other tvs. The only negative is the smallish deck very near the main road. There is a privacy fence but you can hear traffic. We were so busy doing all the fun activities in and near Sunriver that it really didn't bother us. There is a grill and table and chairs for outside, but we mainly are inside. Being close to SHARC is great, especially with kids.. Overall we had a great experience and would recommend it to friends. We had a great time staying in Puma 5. The home is right across the street from the SHARC, so if you have kids that enjoy the pool, this is very convenient. The home has a nice hot tub, cruiser bikes and 6 passes for the pool. Be sure to ask for or bring more fans, as the home has no AC and gets pretty warm at night. 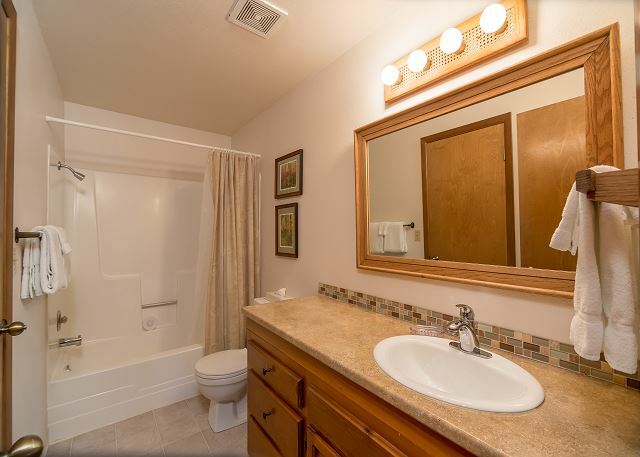 The home is in a good location; fairly close to the entrance/Village and very close to pool. Be sure to make the drive to Crater Lake - well worth it and only 90 minutes away. We had a great time! a guest from Brush Prairie, WA does not recommend this vacation rental. The location, amenities, etc., were perfect. The cleanliness of the inside of the house, furniture, kitchen shelves, blankets, rug, floor, top of refrigerator, etc., age of major appliances, mattress, tv's in bedroom were not acceptable. The windows inside & out were very dirty. The table & chairs were dirty enough that I cleaned them before we would use them and even then they needed additional cleaning. This house needs a DEEP cleaning! If the inside of the house was cleaned, we would rent it again.